This conference is being held jointly with SIAM Conference on the Life Sciences (LS10). To see more photos from AN10/LS10, see our SIAM AN10/LS10 Photoset. Read an overview of AN10/LS10 on the new conference roundup page here. 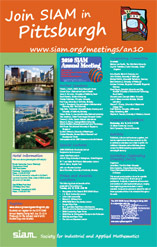 Most of the Invited Lectures and Prize Lectures from the 2010 Annual Meeting in Pittsburgh have been captured and are available as slides with synchronized audio. In addition there are PDFs of the slides available for printing. View presentation slides with synchronized audio. If you’re tweeting about the meeting, please use Twitter hashtag #SIAMAN10. Use the tag ‘SIAMAN10’ if you’d like to share your images and videos from AN10 (without the quotes). Ansu Bagchi, Merck & Company, Inc.